The September birthstone, sapphire, has had a long and storied history. This beautiful gem has been prized for hundreds of years and has been worn by royals, religious figures, and trend-setters throughout the ages. And while sapphires have always been loved and desired, they’ve recently been having an increased boom in popularity. To celebrate the enduring popularity of this breathtaking gem, we’re sharing 18 facts about September’s stunning birthstone sapphire! When people think of sapphires, they usually picture blue sapphires. But sapphires actually come in a rainbow of colors, including pink, green, yellow, orange, purple, black, white (or colorless), and parti (multicolored). Sapphire is a term for all varieties of the mineral corundum that are not red. While red corundum does exist, it goes by the name ruby instead of sapphire. Sapphires are incredibly strong and durable. They’re a 9 out of 10 on the Mohs scale of hardness, which means that the only gemstone harder than a sapphire is a diamond. The largest blue sapphire ever discovered weighed in at a staggering 1,404 carats. This gem, which was discovered in 2015, is called the Star of Adam and has an estimated value of 100 to 175 million dollars. The rarest sapphire color is called padparadscha, which is orangey pink. The name “padparadscha” comes from the Sinhalese (the language of Sri Lanka) word for lotus flower. In the Middle Ages, sapphires were associated with heaven and were often worn by members of the clergy. Sapphires are beautiful, but they’re also very strong and an excellent electrical insulator. 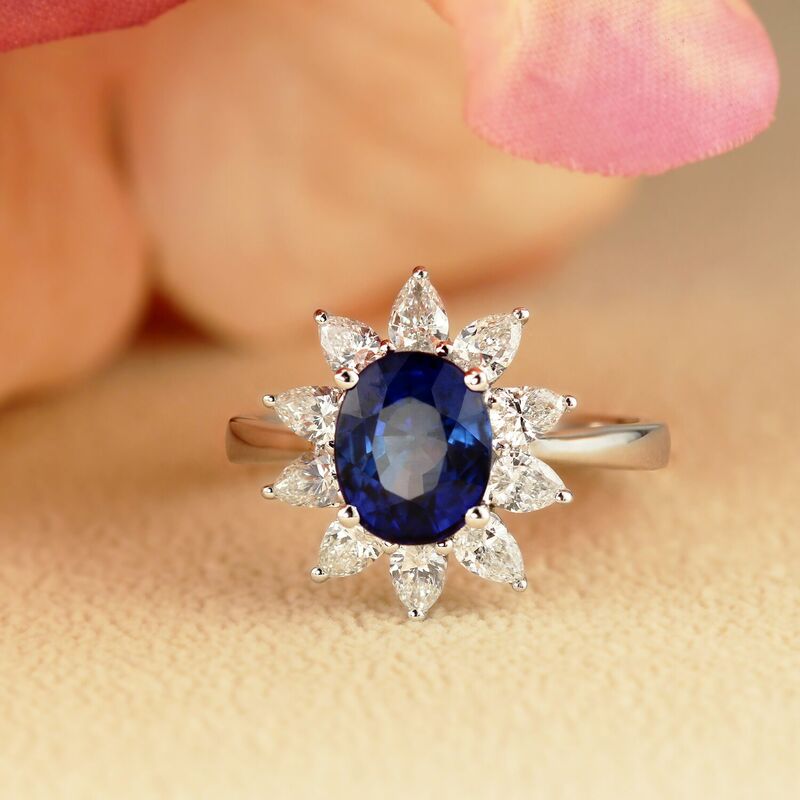 Because of this, sapphires are often used in manufacturing. Sapphires are used in high grade cutting tools, polishing compounds, and electronics (including the Apple Watch, which uses lab-created sapphire glass for its screen). Sapphires are the traditional 45th wedding anniversary gift. 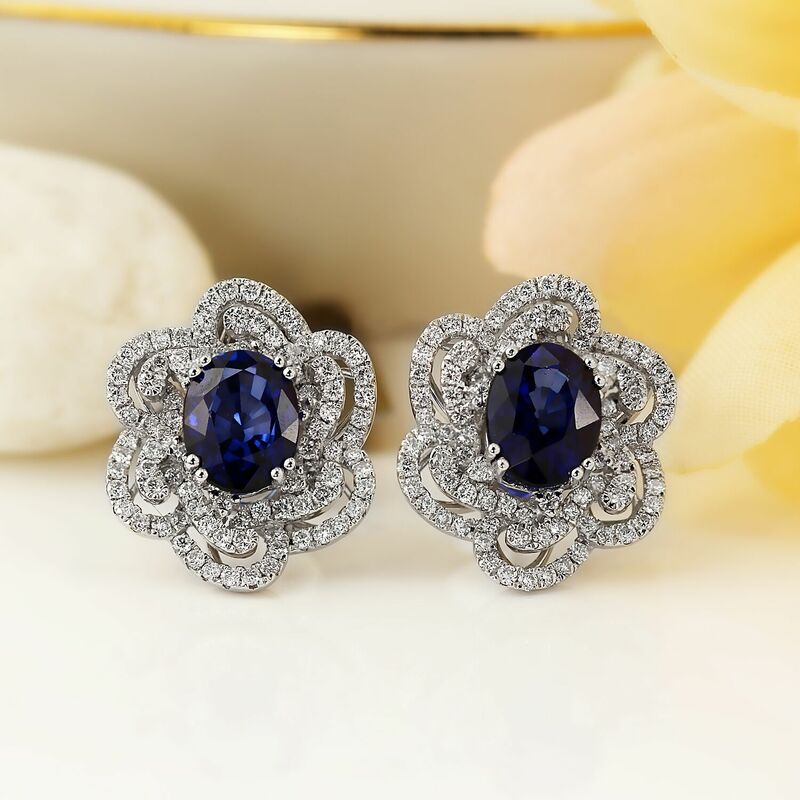 According to Italian superstition, sapphires can offer protection from eye problems and melancholy. Sapphires have been used in engagement rings since the tradition of engagement rings began. In fact, sapphires were the most popular gemstone for engagement rings for hundreds of years, until diamonds became the most popular choice during the 20th century. In traditional Hindu belief, sapphires are associated with Saturn, Saturday, and Shani, the god of Justice. Gem quality sapphires are rare and have been found in only a few locations in the world. Many of the world’s sapphires were found in Sri Lanka, Burma, and Kashmir, though sapphires have also been found in Cambodia, India, Vietnam, Thailand, Australia, and the United States (mostly in Montana). 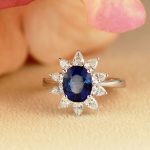 Though sapphires are the birthstone of September babies, who would fall into either the Virgo or Libra zodiac signs, sapphires are also associated with the zodiac sign Taurus (April 22 to May 21). Single crystal sapphires are biocompatible, meaning they are usually well-accepted when used inside the body. Because of this, and because of sapphire’s high durability, lab-created sapphire is sometimes used as a component of hip joint replacements. In 2017, Queen Elizabeth II celebrated her Sapphire Jubilee, which marked the 65th year of her reign. To commemorate the Sapphire Jubilee, the Royal Mail released blue stamps in the same hue as a blue sapphire. While there are many famous sapphires in the world, one of the most famous today is the blue sapphire used in Princess Diana’s engagement ring, which is now worn by Kate Middleton. Sapphires have long been associated with purity and fidelity. In the 13th century, it was popularly believed that the color of a sapphire would fade if it was worn by an unfaithful partner. If you’re looking for an affordable engagement ring, you might think that you have limited options. But that couldn’t be less true! Today, there are so many affordable engagement ring options that prove an engagement ring doesn’t have to be absurdly expensive to be absolutely beautiful. But if you’ve never shopped for an affordable engagement ring before, you might not know all your options. We’re here to help! 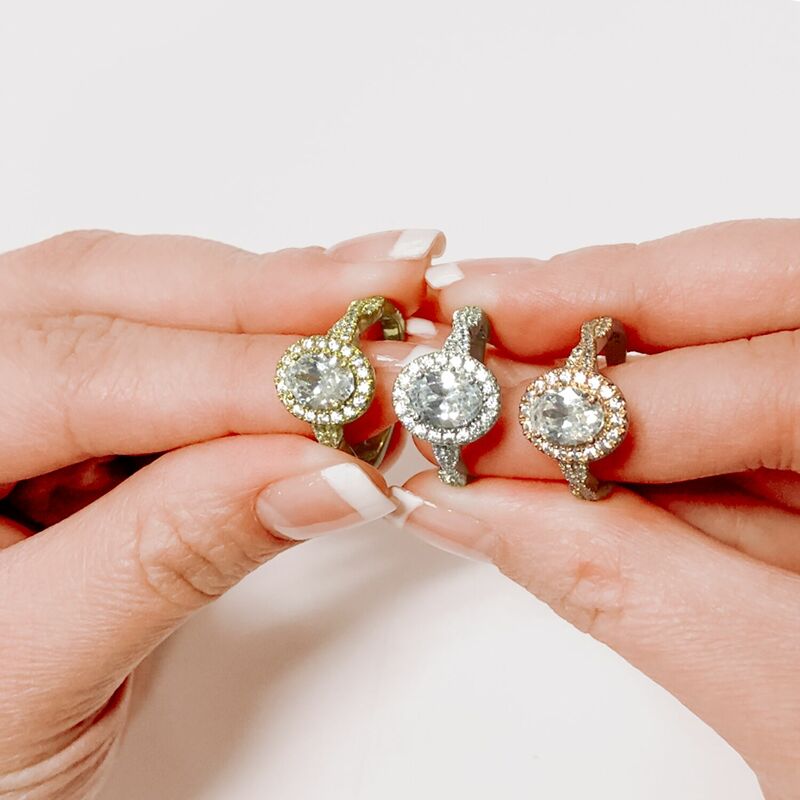 In this post, we’re breaking down everything you need to know about finding the perfect affordable engagement ring for you. We’ll cover what you need to know about budgeting, the best affordable center stone options, and how to choose an affordable engagement ring setting you’ll love. So, you’re looking for an affordable engagement ring. Great! But before you even start shopping, you should consider: what makes an engagement ring affordable to you? What’s your engagement ring budget? People often say that you need to spend a certain amount on your engagement ring (the most common “rule” is that you should spend the equivalent of three months of your salary on an engagement ring). But, truly, there are no rules on what you need to spend on an engagement ring. You should really only spend an amount that’s comfortable for you. So before you shop for an engagement ring, just think about the budget that would be right for you. If your budget is on the smaller side, don’t worry. Shopping on a limited budget doesn’t mean you won’t be able to find a stunning engagement ring. There are so many engagement rings that are beautiful and affordable. And we’re here to show you them! 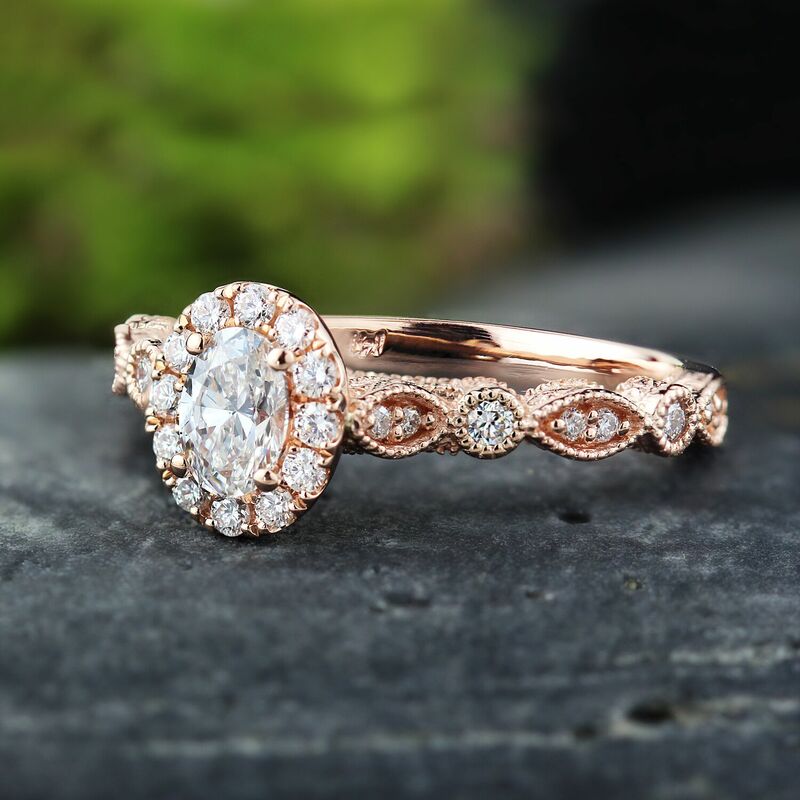 Morganite, pictured here in a stunning marquise halo setting, is romantic, beautiful, and comes with an attractively low price tag. Shop the Skylar ring featured above here. As you shop for an affordable engagement ring, know that there are two components that affect an engagement ring’s price: the ring’s setting and the ring’s center stone. Generally, ring settings are more affordable than center stones (the only exception might be if the setting has large diamonds or gemstones). So if you’re looking for an affordable engagement ring, your choice of center stone is key. Our top tip for choosing an affordable center stone is to go alternative. Not sure what that means? An “alternative” center stone is basically any center stone that isn’t a white diamond. Some beautiful options for an alternative center stones include blue sapphires, morganite, black diamonds, topaz, amethyst, and moissanite. Alternative center stones like gemstones are just as beautiful as diamonds but are much more affordable. And on top of that, they offer you more style variety, allowing you to choose something more unique. If you’re shopping for an affordable engagement ring but have your heart set on a white diamond, you still have options. For a more affordable diamond, you can always choose a lower carat diamond and/or go with a less expensive diamond shape. Fancy shaped diamonds (which are any diamond that’s not a round brilliant) are usually more affordable than round brilliant diamonds of similar quality and carat. If you love the look of a white diamond but just don’t think you can fit one you’d be happy with into your budget, you can also consider choosing moissanite for your center stone. Moissanite (featured above) is a stunning, highly brilliant white gemstone that looks remarkably like a diamond but costs around 90% less. 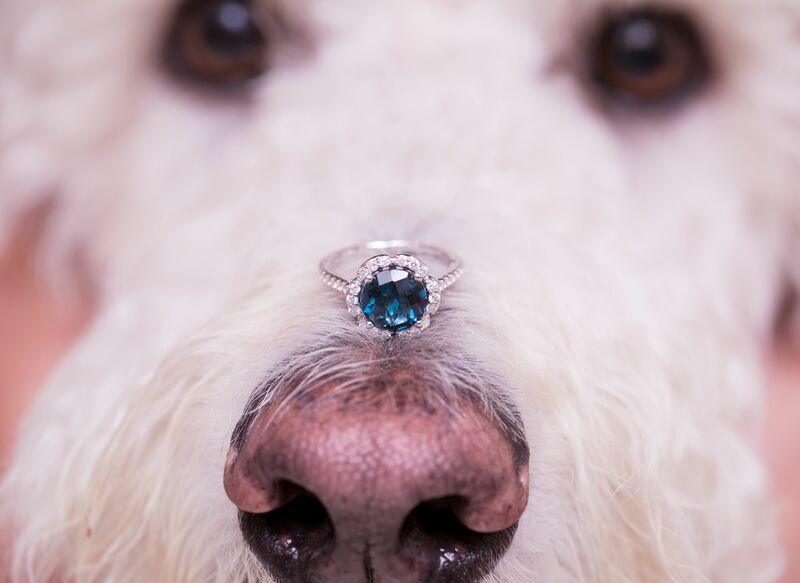 A scalloped halo setting adds glamour and impact to this beautiful— and, remarkably, still affordable— blue topaz engagement ring. 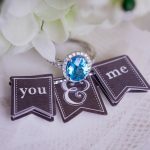 Shop the London blue topaz engagement ring featured above here. We’ve already covered some ways to choose an affordable center stone— but what about the setting? 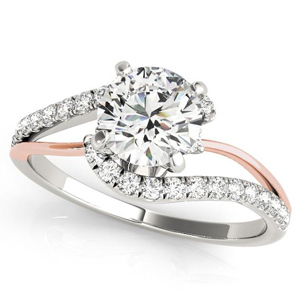 The most affordable type of setting would be a simple, chic solitaire in gold (yellow gold, white gold, and rose gold are all similarly priced). If you’re looking for affordable ring settings, you’ll want to avoid platinum, which is by far the most expensive precious metal. While solitaire settings are generally the most affordable option, settings with pave diamonds can also be affordable and are a great way to up the glamour and impact of your center stone. Settings with pave diamonds add brilliance to your engagement ring, which tricks the eye into thinking it looks larger, even if the pave diamonds are small and only along the band. 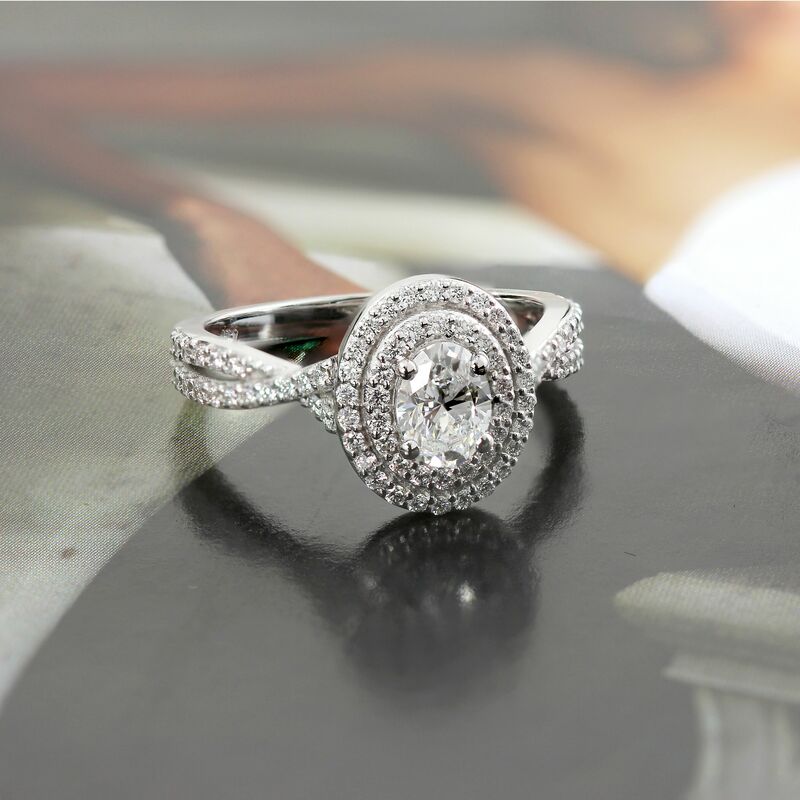 Halo settings are particularly good for enhancing an engagement ring when you’re on a budget. A halo of diamonds will make your center stone look more glamorous and sizable for a fraction of the cost of upping the size or quality of the center stone itself. 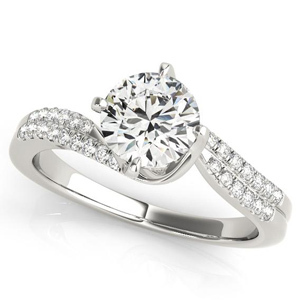 Oval diamonds are quickly becoming one of the most popular fancy diamond shapes. This shape is loved by brides who are looking for something dazzling and glamorous, yet a bit more unique than a standard round brilliant diamond. 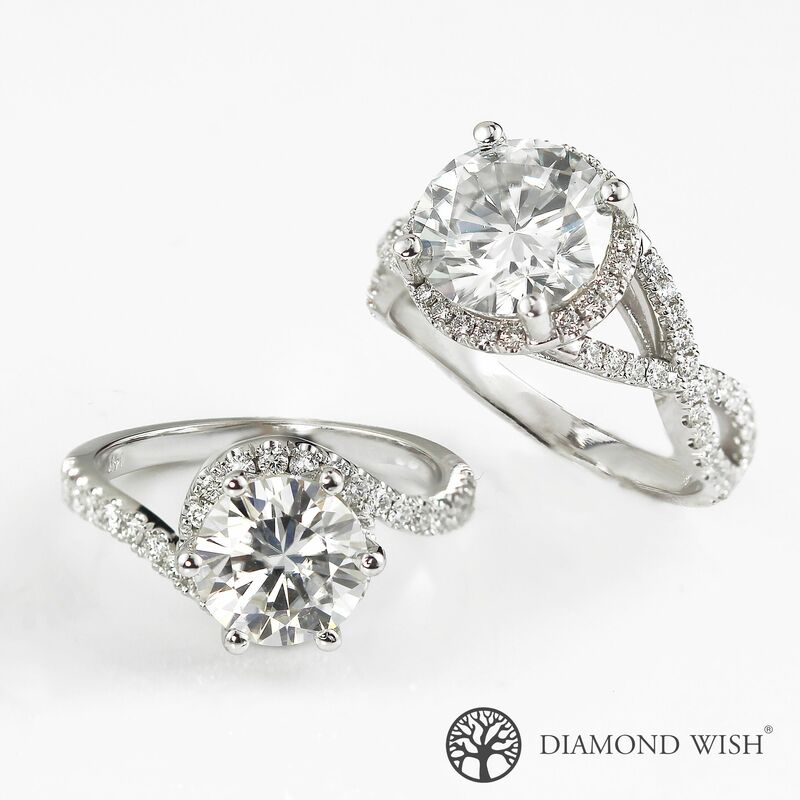 There’s so much to love about oval diamonds. They have an elegant style, high brilliance, a slimming effect on the fingers, and they even look bigger per carat than other diamond shapes. Oval diamonds have a higher surface area on their table (their top), which means that this top surface area is maximized, making the diamond look bigger. To celebrate this stunning shape, we’ve put together a list of some of our favorite dazzling, distinctive oval cut diamond engagement rings. Read on to see our list of our top unique oval diamond rings! The Emilia Oval Diamond Ring has a romantic, vintage-inspired design. This eye-catching ring features a shimmering oval diamond enclosed in a luxe halo setting, which rests along a unique band. The band of the Emilia ring boasts delicately engraved round and marquise shapes crafted from 14k rose gold. Inside these shapes lie round diamond accents, which add to the beautiful brilliance of this lovely engagement ring. 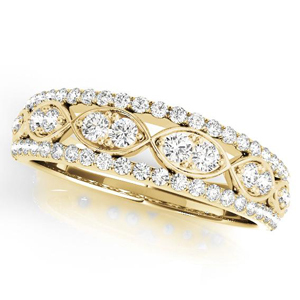 The Nicole Oval Diamond Ring features a spectacular triple band. 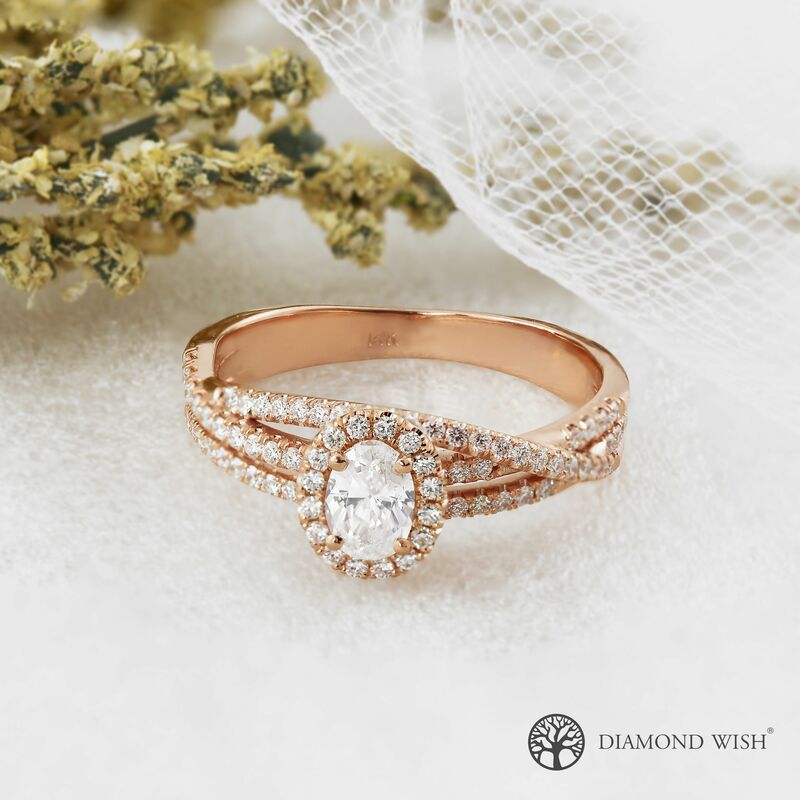 In this design, three rows of diamond set rose gold lines overlap to create a distinctive, contemporary look. Atop this band rests a magnificent oval diamond surrounded by a halo of diamonds, which beautifully match the diamonds along the band, creating a cohesive— and highly brilliant— look. Looking for glamour? The Vivian Ring is your perfect match. In the Vivian Oval Diamond Ring, the chic silhouette of the ring’s center oval diamond is echoed by two gorgeous diamond halos. These luxurious, size-enhancing halos are complemented by a slim diamond set band, which adds even more shimmer to this boldly beautiful design. The Alice Oval Diamond Ring is delicately detailed and absolutely beautiful. 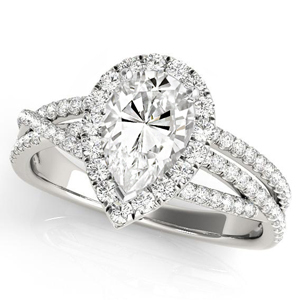 This romantic style features a halo set oval diamond that rests along a twisted diamond band. Underneath this ring’s regal raised setting, this design features two engraved swirling accents, which echo the shape of the ring’s unique band. 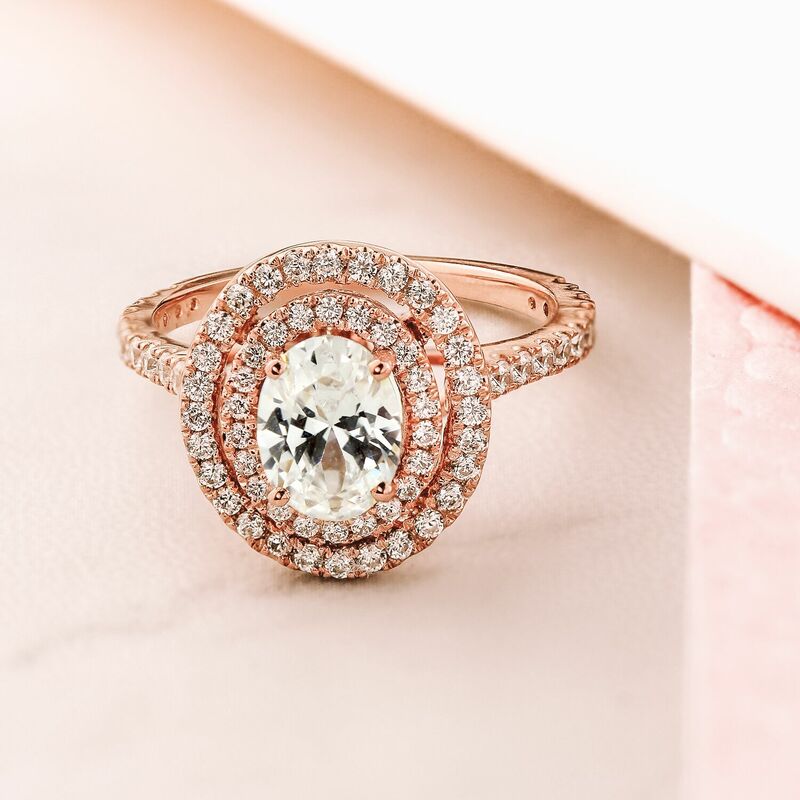 Available in yellow gold, white gold, rose gold, and platinum, the Alice Ring can be customized to create your ideal oval diamond engagement ring. Want to see even more unique oval diamond rings? Click here to view our full collection of oval diamond engagement rings. We all know that diamonds are used in engagement rings because they’re a symbol of eternal devotion. But do you know the meaning of gemstone engagement rings? Gemstones are a gorgeous, eye-catching addition to an engagement ring. But gemstones are also an excellent way to add unique sentiment to your engagement ring, as each gemstone has a different meaning. In this post, we’re covering the meaning of some of our favorite gemstone engagement rings. Read on to learn the meaning of these beautiful precious gems and see which might be right for your engagement ring. 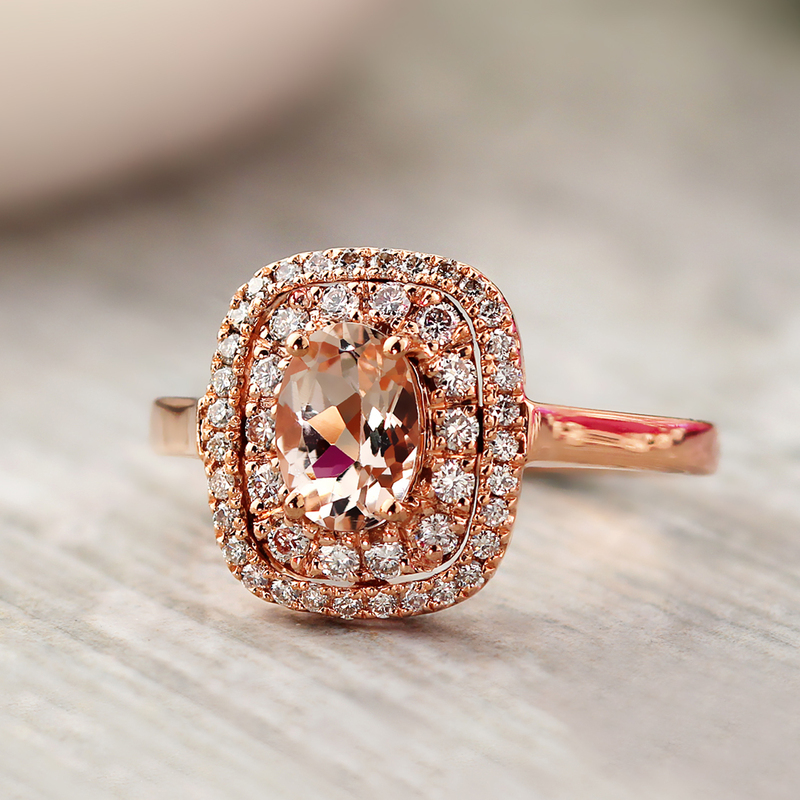 The lovely pink hue of morganite is complemented by a dazzling diamond and rose gold setting in the Hazel Ring. 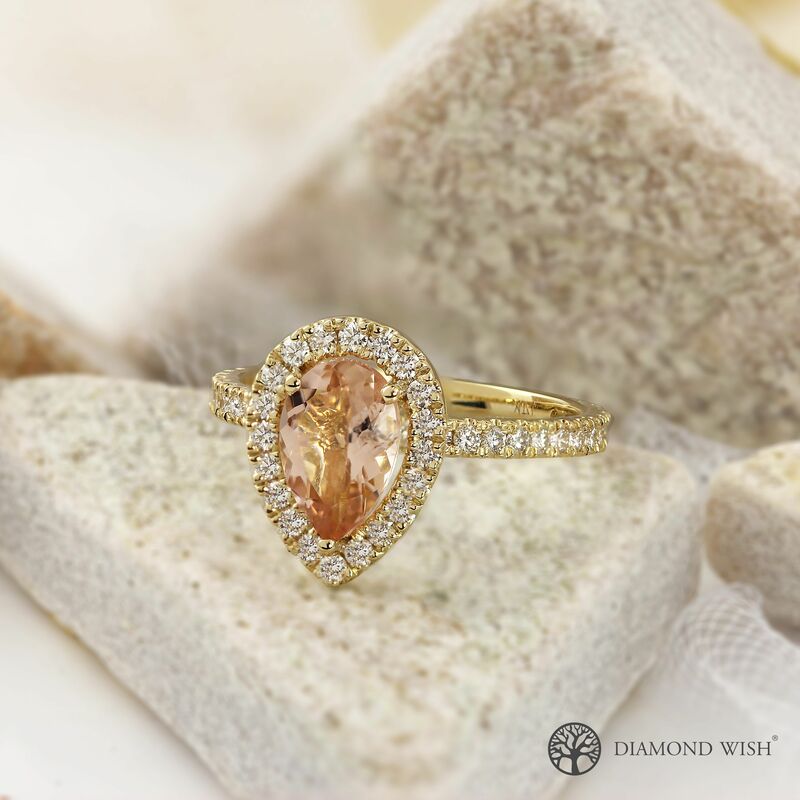 Morganite is a rare gemstone with a beautiful, blush pink color. 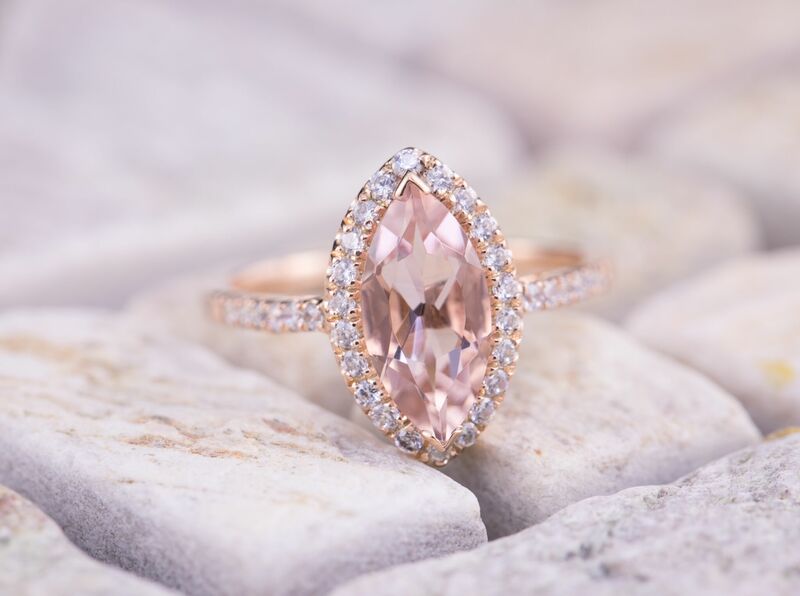 Because of its soft pink hue, morganite is associated with the heart chakra, our center of love. Morganite engagement rings are associated with unconditional love, joy, and deep compassion. 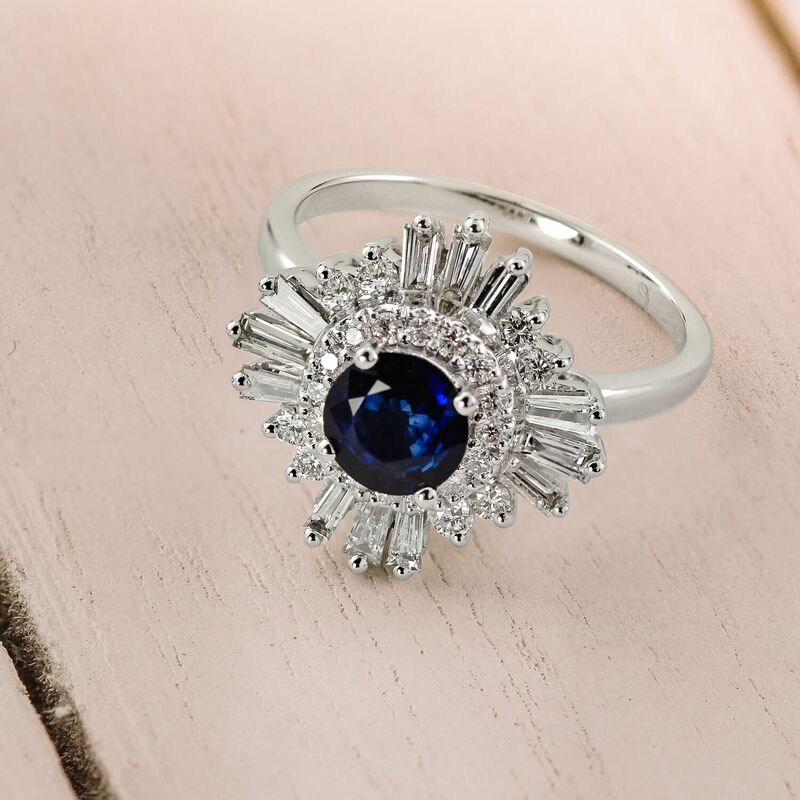 Here, a mesmerizing blue sapphire is used in the unique, vintage-inspired Charleston Ring. 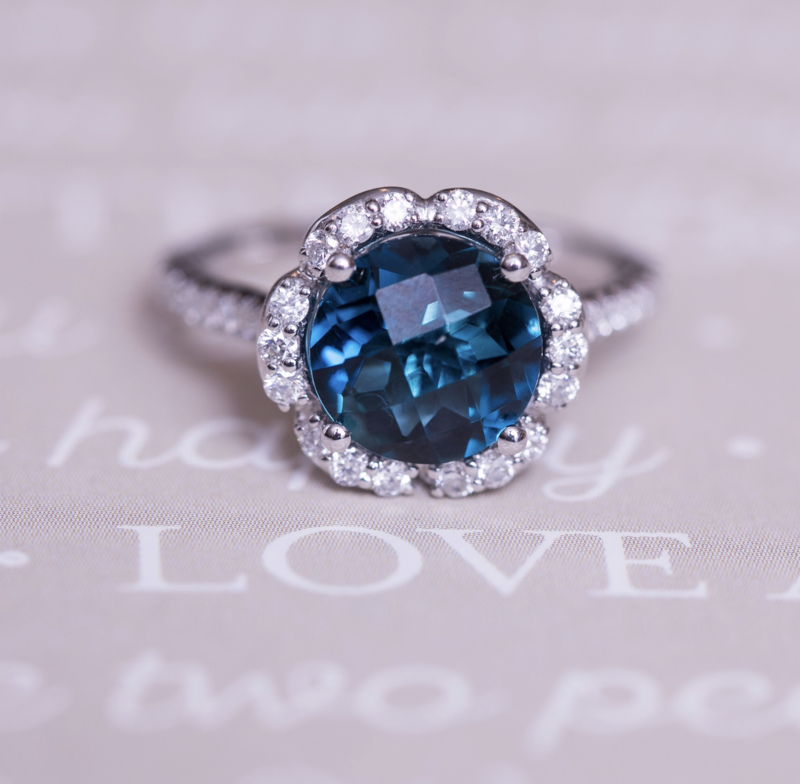 Blue sapphires were once the most popular center gemstone for engagement rings. Before diamonds became popularly used in engagement rings in the early 20th century, sapphires reigned supreme. The blue sapphire was popular due to its rich blue color, but also because of its lovely meaning, which is particularly appropriate for engagement rings. 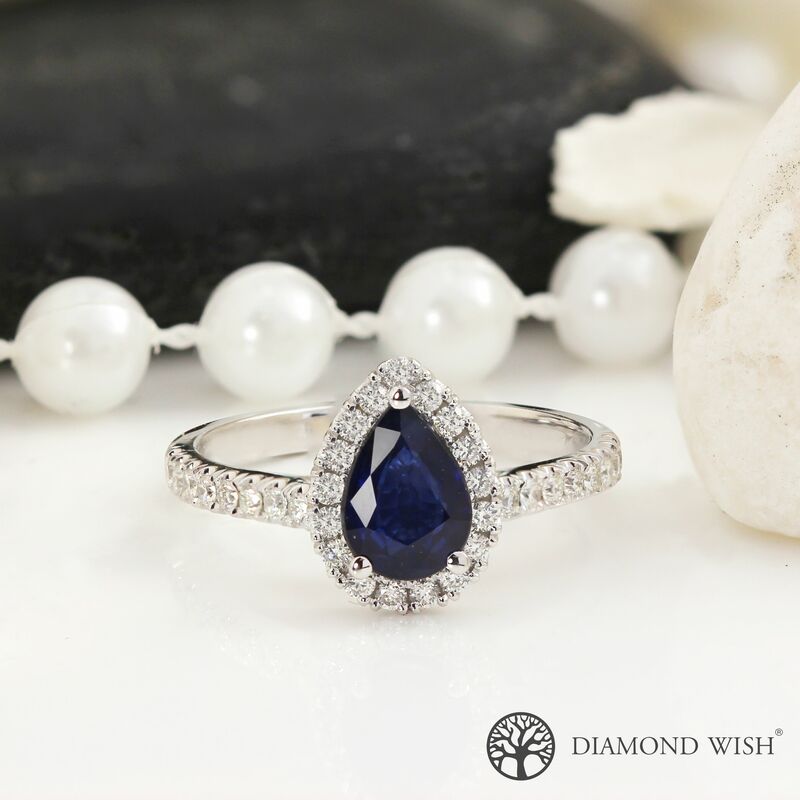 This deep blue gem is thought to symbolize faithfulness, sincerity, and good fortune. 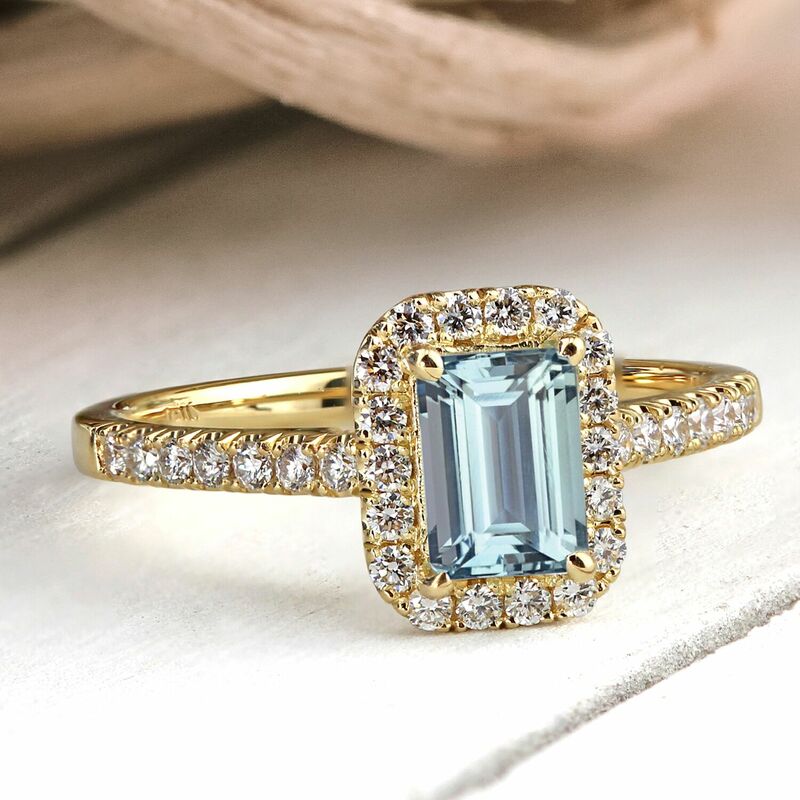 A crystal clear emerald cut aquamarine shines in the romantic Skylar Ring. Aquamarine is a glittering, light blue gemstone that’s often associated with water and the sea. Because of this, aquamarine has long been a gemstone that’s associated with sailors. It’s even sometimes called the “Sailor’s Stone” and is thought to bring protection to those sailing the high seas. Aquamarine is also thought to bring the wearer good health, mental clarity, and courage. 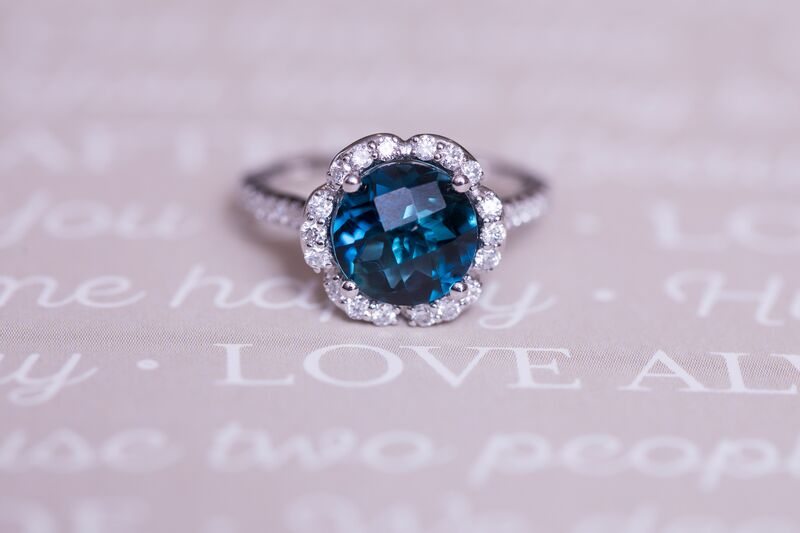 Blue topaz adds rich beauty to this uniquely lovely scalloped halo engagement ring. Topaz is a beautiful gemstone that comes in a variety of colors, like blue, yellow, and pink. This gem is associated with calmness, peacefulness, and inspiration. While all varieties of topaz are said to bring a sense of peace to the wearer, each color of topaz has its own unique meaning. 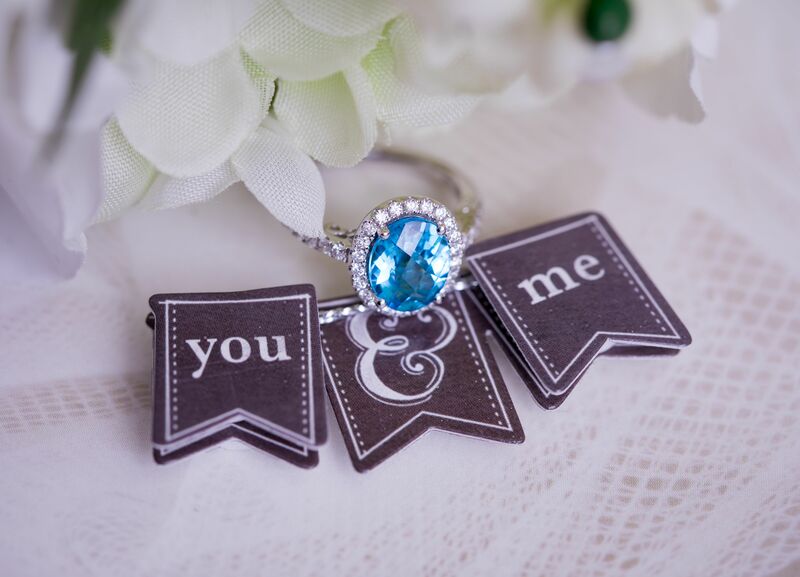 Blue topaz is a popular variety of topaz for engagement rings, perhaps because of its lovely meaning. Blue topaz is said to be a stone of love and good fortune, and is also said to promote positive communication, openness, and honesty. In the past few years, it’s become more and more common for brides-to-be to choose what’s called an “alternative engagement ring,” which is a term for a non-diamond engagement ring. Wondering why so many people are going “alternative?” It all comes down to style and uniqueness. Alternative engagement rings come in a dazzling array of different colors and styles, allowing brides to choose an engagement ring that both feels more personal and stands out from the crowd. With alternative engagement rings, there’s so much to love— and so much to choose from! 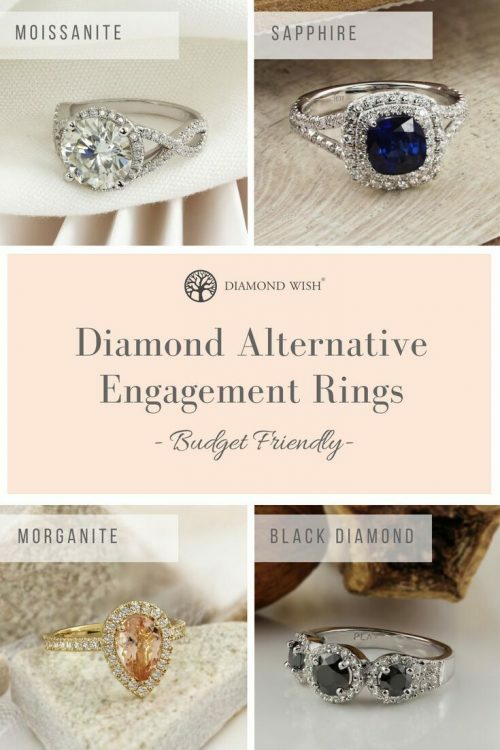 In this post, we’re highlighting some of our favorite alternative engagement ring ideas to help you get inspired and find the alternative engagement ring style that’s right for you. The beautiful depth of a blue sapphire is enhanced by shimmering accent diamonds in this double halo cushion cut blue sapphire engagement ring. One of the best things about choosing an alternative engagement ring is being able to add rich, vibrant color to your ring with a center gemstone. But while gemstones provide beauty through color and luster, they’re usually not particularly brilliant (meaning, sparkly), especially when compared to a highly brilliant white diamond. But why not get the best of both worlds— the color of a gemstone and the brilliance of diamonds— by choosing an alternative engagement ring with accent diamonds? Accent diamonds can add beautiful brilliance to an alternative engagement ring. 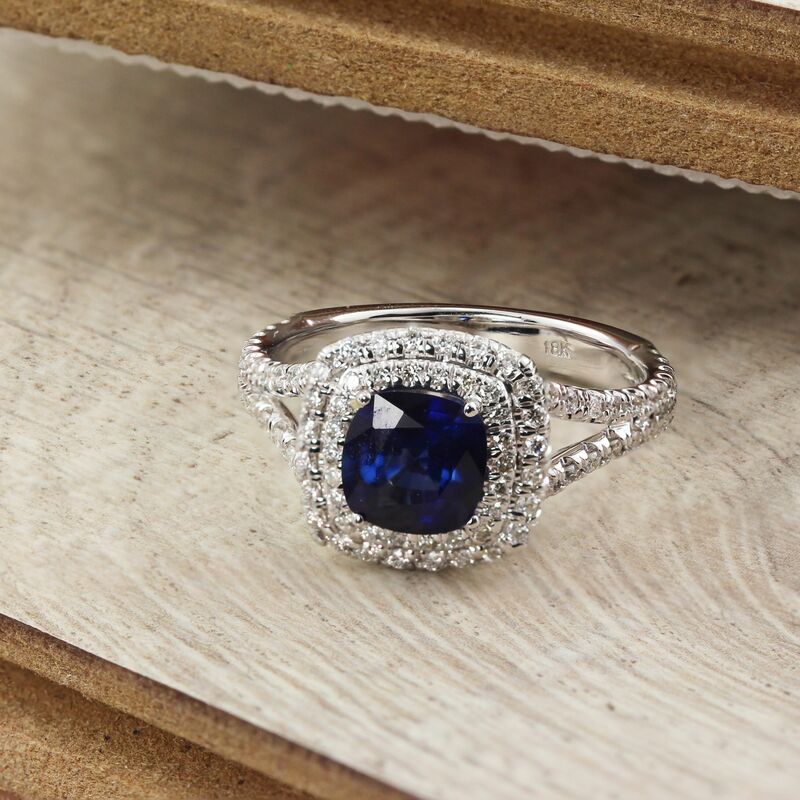 And while all gemstones look gorgeous in an engagement ring setting with accent diamonds, we’ll admit that one is our favorite: blue sapphires. The deep color of blue sapphires looks especially stunning when surrounded by accent diamonds, as their rich color pops against a brilliant white background. A pear shaped morganite gives this halo morganite engagement ring an utterly unique look. Another great thing about alternative engagement rings is they give you the ability to express your personality through your ring by allowing you to choose something more unique. So why not lean into that uniqueness by choosing an unexpected gemstone shape and a less common center gemstone? There are so many unique gemstone shapes you can choose from, like emerald cut, marquise, and pear shaped. And there are also many unique gemstones to choose from, like morganite, amethyst, citrine, emerald, and so many more. A shimmering blue topaz is surrounded by a lovely vintage-inspired halo setting in this eye-catching halo blue topaz engagement ring. Gemstones lend themselves to a vintage look. While diamonds are the most popular center stone today, during the vintage era, gemstones reigned supreme. So for alternative engagement rings, leaning into the vintage look is an excellent way to enhance the charming, unique appeal of your center gemstone. And there are many gorgeous vintage-inspired setting options available for gemstone styles (for our engagement rings, you can always select your desired gemstone, then sort to show only vintage setting styles).